She...accepted. Or, rather, she commanded it - he was in her own home territory after all. But regardless of that! A buzz thrummed at his heart, his chest constricting tight from sheer elation and nervousness and triumph and StarClan, who knew what else! It was at this point that loyalty to ShadowClan drifted far from the crevices of his mind, faded away alongside with the last remnants of his apparent hostility. A head came to tilt against the frame of his shoulder, his chin dipping in an accepting nod. "As you wish, ThunderClan warrior," came Nighthawk's rumbling murmur. Despite how he supposed it was Sorrelfeather whom ought to take the escorting lead, Nighthawk couldn't keep the thrum from his paws as he glided past the she-cat, and took up a steady pace ahead. Something akin to uneasiness awoke in his heart, besides the happiness he felt at the few stolen moments he'd managed to grasp onto with his new ThunderClan associate. What would Rosestar say, if she saw you now? One tooth came to squeeze down upon his bottom lip, drawing a blossom of scarlet red from the wound. But really...this was all wrong. So why did it feel right? More importantly, now that Sorrelfeather strode with him, what could he say? Oh yes, Sorrelfeather, what lovely weather StarClan wields tonight. Don't you agree? No, much too boring. Oh! How about something impressive, like, I hold more power in my one claw then the entirety of StarClan put together! Ah, that last one was quite tempting, he liked it. Mental note to self, Nighthawk, use that with Sparrowclaw next time; that'll shut 'him up. But even that didn't feel right to say to the femme. He cleared his throat, awkward, hoping to break the suffocating tension that was suddenly crowding in on him and twisting at his throat. Think, Nighthawk, think! You're an intelligent being - incredibly handsome too, might I add. Oh, stop it, you! No, you stop! No, I must insist, you should be the one to stop. Nighthawk, dear me, you're flattering yourself! The first sign of an incredibly lonely creature: bickering to oneself. But wait, quiet down, my immense brain! That is not the problem here - words, words, what words can I conjure...what sounds...hrm...impressive? Something...great? Ugh, why do I even want to impress her anyway? She's an enemy! A good-for-nothing, bloated, annoying... "stinky, rotten, soft-footed ThunderClan ninnyhammer!" The words left his tongue before he could even halt them. And it was only then, as he allowed them to digest in the air, that Nighthawk realized his rather brash mistake. "As you wish, Thunderclan warrior." despite that it was her who was to be leading him to the border, he took charge on swift paws, leaving sorrelfeather to hobble behind him. why that pesky, no-good shadowcat. why i oughta' - with an agitated huff, the she-cat struggled to quicken her pace (although she managed to do so quite well), and soon enough she was right alongside him. yeah, run right ahead, cause i'm not injured or anything like that, she grumbled alongside him, her words breaking the silence that had fallen between them. why had he moved so quickly to get ahead of her, anyhow? was it possible that he was itching to get away from her? her heart broke at the thought, though she knew not why she cared so much. what if he finds my company annoying? she fretted, concern shadowing her face as she became lost in her own thoughts. will he toss me to the side like inkclaw did? like hailpaw? the thoughts caused bile to rise in the she-cat's throat -- she couldn't let that happen, not again. "stinky, rotten, soft-footed Thunderclan ninnyhammer!" his words were unexpected, warranting the she-cat to stop dead in her tracks. what did he just -? her brow furrowed, lip curling up in the beginnings of a snarl. she had no clue what a "ninnyhammer" was, but it definitely wasn't good. "what did you just say?" she snarled, green eyes ablaze with anger. she figured he was talking about her, not knowing that he was speaking about thunderclan as a whole. his words hurt and her anger leeched from her pain -- his insults were just blows to her already deflated ego. you fox-hearted, feather-brained, crow-food eating, idiotic, good-for-nothing excuse for a cat! if you had a problem with me you should've just said something from the start, instead of ranting about it in your mind and putting on a front to my face! how could you even... why would you even... you don't even know what - her anger gave way to her pain and her eyes began to glisten with tears. don't you dare sorrelfeather! she chastised herself for her weakness, squinting against the hot tears that had collected themselves at the corner of her eyes. once her eyes snapped open, they were hard and angry. with a stomp of her uninjured leg, she lifted her paw and aimed to cuff him right over the ears. Ah, yes. He knew a mistake when he saw one. The moment his thoughts morphed into hurtful words, and leaped off the tip of his tongue, was the moment he knew he'd made a fatal error in his calculations. Ah, StarClan, how could be so darn stupid? She wasn't stinky, or rotten - no, she smelled more like flowers and daisies to him, so why had those hate filled words slipped from his mouth so fluidly? He felt guilty, seeing the flash of pain in her eyes, and that guilt only intensified when it was replaced by a blazing anger. No, no, this was wrong - he was ShadowClan, he ought to be justified in dishing such a raucous insult. But there was something scrawled across her countenance now - an emotion he could not pin point - that made him squirm. He bowed his head, her harsh reprimands hitting sharp at his ear drums. In all honesty, to an outsider it would've looked like a kitten being scolded by his mother. But Nighthawk was no kitten, and even he had his pride. There was a sharp whack - a flare of pain burning bright around his ear - and multicolored eyes stretched wide in a mingling of disbelief and starstruck horror. She'd hit him. Actually hit him. Like...with a paw, and a cuff, and then - she'd hit him! Him, of all the cats! He didn't know whether to be offended, or oddly impressed by her vibrant show of bravery. Still, pride is pride nonetheless. And being impressed definitely didn't heal the salt on the wound. "W-What was that for?" he spluttered, scrambling back from Sorrelfeather as if expecting her to tear out his throat next. Okay, yeah, he could cross soft footed off the list next too, she was definitely not that. Hey, he's not a crybaby - that paw hurt, man. "I can take your scolding," he scoffed, puffing out his chest and jutting out his chin indignantly; "but swatting a tom of my caliber right where it hurts? How very undignified. ThunderClan ought to be ashamed." Quickly he swept down to rasp a salmon pink tongue over the ruffled fur of his chest, hoping to hide his embarrassment at being so outclassed all the while. "But...if it makes you feel any better..." He paused, a whoosh of a sigh escaping heavy through his flared nostrils. "I retract my previous statements. They're obviously quite untrue." And a hint of amusement softened his voice at the very end of that sentence. a spark of triumph washed over the she-cat, quicklyreplaced by a wave of guilt. she'd hit her targert... and felt absolutely horrid for doing just that. oh my starclan, she breathed, backing away from the shadowclan warrior with a disbelieving shake of her head. i don't know what came over me... you just made me so mad and i... she was appalled by her actions, truly. this was not how hickoryheart had raised her to behave, and there wasn't a doubt in her mind that her elder sister would be disappointed in her. nighthawk, i didn't... i'm so sorry, it won't happen again. she bowed her head, obviously remorseful, although her gaze snapped right back up at him once more when he spoke. "W-What was that for?" you've got to be kidding me. was he serious? her anger came back tenfold and she shot an icy glare in his direction, her voice coming out low and eerily calm as she said, you insulted me and then ask what i hit you for. have you no sense!? her voice rose with each passing word, getting loudly until she was practically yelling at him. "Thunderclan ought to be ashamed." oh, he did not just... are you saying i'm something to be ashamed of? her voice was no longer loud, nor was it laced with the previous anger from before. it was low, like the whisper of the winds her territory caught from windclan's moors. and pained. how could one such as she carry so much sorrow in her heart? he spoke a bit more, words meant to appease her, but she no longer wished to speak. instead, she hobbled past him, her pelt brushing his, and matter-of-factly stated, come on. the sooner we get you to the border, the sooner you can get home and off of "stinking" thunderclan territory. To say he was now terrified of Sorrelfeather would be the understatement of the century. Everything he said, no matter what slipped off his tongue, seemed to only further worsen the situation at paw. Her burbled apologies morphed into offense once again, hurt twisting her tone as she meowed, "are you saying I'm to be ashamed of?" Nighthawk muttered a hushed obscenity, both desperation and confusion curdling the blood within his veins to ice. "Y-You know that's not what I meant!" the tomcat spluttered, eyes stretching wide as she hobbled briskly past. For a brief moment he felt their fur connect, and a shudder of anticipation rippled down the curve of his spine. But then she was padding ahead, the contact broken, and his side feeling peculiarly empty without her presence there to fill it. "Come on. The sooner we get you to the border, the sooner you can get home and off of stinking ThunderClan territory." Nighthawk rolled his eyes at that, though for once the words felt sticky and dead within his throat, his usual flowery flourish and bravado faltering in an instant. Instead, all he muttered was a vaguely amused, "she-cats," and after a moment's hesitation, followed after her. He said nothing for a long while, instead tracking the arcs of the trees, and the snaking woodland that unfolded on all sides. A hint of tar touched at his nostrils, and he knew they must've been close to the Thunderpath right now. Loss hit him hard at the chest, as realization of their brief time together collapsed like a heavy weight upon his shoulders. Right - soon they'd part, and that would be it. Ears twinged back against the nape of his skull, disheartened at the mere thought. Nighthawk froze to a stop, just as the familiar ribbon of black snagged at his peripheral vision. So close now. "Er...I am sorry," he meowed, in a surprisingly sincere tone; "I didn't mean to, uh...insult you. Or your Clan." A disdainful sniff, as he couldn't help adding, "though honestly, with the awful things you said about ShadowClan, I think we ought to call it even." "Y-You know that's not what I meant!" he spat and sputtered for an explanation, but the reddish-brown she-cat cared not. because deep down, she knew what he said was true. she may not have been a disappointment to thunderclan but, in her heart of hearts, she felt as though she was the biggest disappointment to those who truly mattered. batfang. her beloved son, hailpaw. starclan, even ashpaw, who loved her with everything he had. she hobbled forward, refusing to even acknowledge the shadowclan tom's words. she'd tuned him out for the most part -- not that it made any difference, for they both padded to their destination in complete silence. she listened to the calls of the night owls, relished in the song of the crickets, yet only for the moment. 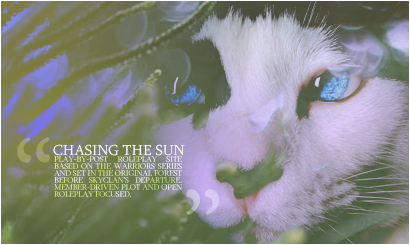 as the scent of the thunderpath invaded her nostrils, the beautiful noises of thunderclan's forest began to dissipate. "Er... I am sorry," the she-cat paused, looking over her shoulder in shock. had he just apologized? "I didn't mean to, uh... insult you. Or your clan." it was obvious by his tone and the way he awkwardly carried himself that apologizing wasn't in his nature. this made her feel special and she couldn't help the small smile that crept onto her face. though honestly, with the awful things you said about Shadowclan, I think we ought to call it even." the she-cat laughed, genuinely laughed, and mewed, i only said those things after you insulted me. her pale green gaze shifted towards the thunderpath and worry pricked at her heart. it seemed clear, but you never knew when it came to the monsters. those insults were more directed at you than anything, she mewed, amusement lighting up her face. she moved closer, just so to where their pelts were brushing once more, and added, i guess this is where we part ways. you'll be okay, right? She laughed. She'd actually laughed. Her mouth melted from a scowl to the softest of smiles, the lyric of her amused laughter ringing light throughout the forest. He paused, abruptly overcome by a sweet wash of emotion so unlike anything he'd ever had the pleasure of experiencing before; a dark plume of a tail draped across the small of Sorrelfeather's back, an undeniably stiff and awkward gesture, but resonating with a rare flash of sincerity nonetheless. Nighthawk awkwardly cleared at his throat, glancing away from the companion that padded at his side and instead directing his focus on the ribbon of tar that flowed to oblivion ahead. It felt like mere seconds since he'd met this odd excuse of a ThunderClan warrior, and the thought of their inevitable parting sent a sour, metallic taste touching upon his tongue. Finally his paws came to halt at the moon washed silver of the Thunderpath. "I guess this is where we part ways. You'll be okay, right?" The spell was broken, snapped in two as if it were a mere twig. Quickly Nighthawk pulled away, static buzzing from where his fur once touched so gently at hers, and his flank begging for the warmth of her breath once more to stroke at its side. But all good things must ebb to their inevitable end. He heaved in a cool gasp of icy twilight air, savoring the sting as it stabbed sharp at his lungs. "Me? Okay?" Nighthawk's huff escaped as indignant, though in truth he was mostly trying to come across as impressive. "I'm a ShadowClan warrior, for StarClan's sake! The darkness is my friend! But promise me one thing, madame; remember my name, for it will one day be the name to rule the forests and beyond!" He paused, a sudden flash of anxiety flitting before his variegated eyes. "You...do remember my name, correct?"